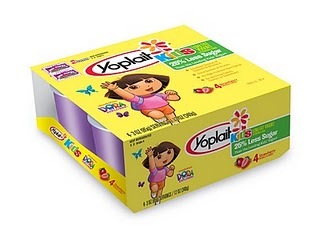 I have six coupons to give away, each one good for a 4-pack of Yoplait Kids yogurt. Open to US mailing addresses only (*note- coupons not valid in ID, LA, MN, NV, NJ, ND and TN). Visit Yoplait and let me know what your favorite product is or what you think you'd like best! 4. Enter any of my other currently ongoing giveaways- leave a separate comment for each one that you enter! 5. Put my button (code on the right side of this page) up on your blog and let me know where I can find it! Giveaway will close at 9PM Pacific time on June 12, 2011. I'll choose winners with random.org and will email those people who will then have 48 hours to respond. Good luck! Disclosure: I received these coupons from Yoplait and MyBlogSpark as thanks for my time in writing another post. I was not compensated in any other way and all opinions posted here are mine and mine alone. my kids love the Yoplait thick and creamy strawberry banana and french vanilla yogurt. My favorite is Yoplait Greek yogurt; my kids love Yoplait Kids in strawberry! Just give me the plain old strawberry banana! My daughters like Simply Go-GURT in mixed berry. My favorite is the Yoplait Whips - key lime flavor! My favorite product is their Mixed Berry yogurt. Thanks! My favorite Yoplait product is the Original yogurt in key lime pie flavor! I entered the EdenFantasys Giveaway! I entered the Schick Quattro for Women Giveaway! Their Yoplait Chocolate Mousse Whips Sounds great. My favorite product is the Yoplait Honey Vanilla Greek yogurt.